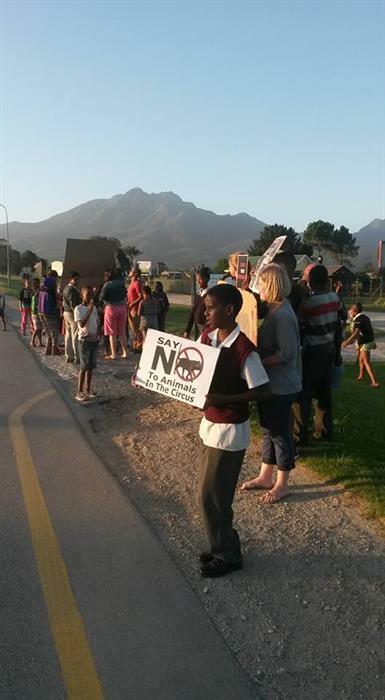 The protesters next to the circus tent in Knysna Road on Tuesday. GEORGE NEWS - A group of local activists is protesting against animals performing in the McLaren Circus during the circus's stay in George from Tuesday 9 to Sunday 14 February. The group, which call themselves Initiative against Circuses Group, is worried about the heat that animals like lions, tigers and camels are subjected to when transported, and are also against the tricks that are "against their natural instincts". Upon learning of the perceptions of animal maltreatment, and the intended picketing, David McLaren, owner of the circus, insisted that the George Herald does an on-site inspection. McLaren went out of his way to dispel accusations of animal cruelty levelled at his circus. During Tuesday's interview he was emphatic that his lions and tigers and all his animals are well-treated and that the animal shows are basically a one-man act, as he is the only handler. He said as a performer, who gets into the arena with them, it is in his own interest to ensure that they do not hate him or have any scores to settle. McLaren (35) maintains he is devoted to his animals' wellbeing. This includes being sensitive to their mental as well as physical health. He personally feeds and cares for them. The animal performances of the 'big cats' last about 20 minutes on average and is based on positive reinforcement training, as well as stimulation practices. "I hand-reared all of the animals in the circus. For the first few months, when they are small, they share my caravan. This is to ensure that they are totally conditioned to living in a circus and to travelling in vehicles. They are then moved to bigger spaces of their own. Journeys from town to town are anything from an hour to four hours." It is therefore a myth that animals "travel all day in the heat". He says the cats sleep up to 22 hours a day, are well-fed and given shade and water. "Look for yourself. Do you see any signs of scars or maltreatment? Do they look stressed or diseased to you? The activists who are against circuses are even against dogs and horses doing tricks - even when it is an innate ability." Local spokesperson against the circus Helga Krietsch, said circuses are outdated and if people want to see animals they go to game reserves. "It is an outmoded idea that people want to see animals in captivity, let alone doing tricks." The group is picketing opposite the circus in Knysna Road between Pine Lodge and Mujo's Restaurant from Tuesday to Friday 18:00 to 19:00 and on Saturday from 14:00 to 15:00. They are endorse the Ban Animal Trading Compassion in Action that states: "Animals do not choose to perform, and will not do tricks on command, every single day, like jumping through hoops, dancing, sitting on chairs, and walking upright on their back legs, because they want to. They only do this because they have no choice and are afraid of what will happen if they don't perform. "Circus animal training methods are questionable and training always happens out of the public eye. "Although most circuses will claim to train using positive reinforcement, in reality, training is often based on a system of intimidation, reward and punishment, which can even mean the withholding of food and water." For more about the circus programme, location and performance times, see page 24. The performing poodles with circus boss David McLaren. Helga Krietsch is one of the Georgians who is against all circuses with performing animals. Mowgli the tiger came out of his travelling/sleeping cage on Tuesday to lie beside his friend the white lion.